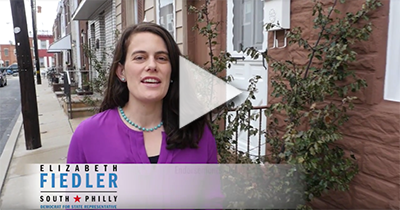 Former WHYY reporter Elizabeth Fiedler announced Tuesday she’s getting into politics, running in next year’s Democratic primary for a South Philadelphia state legislative seat. Fiedler is taking on incumbent Bill Keller, who’s held the seat for 25 years. Surrounded by supporters in Dickinson Square Park, she gave a speech that could have come from Bernie Sanders, calling for universal health care, expanded family leave and full funding for schools. Fiedler endorsed the “Fair Share” tax plan advanced by the Pennsylvania Budget and Policy Center, which calls for raising taxes on the wealthy to pay for needed government programs. Fiedler, who said she’s active in several community and educational organizations, said she has lived in the district since December 2015. Keller said his priority has always been creating good jobs, and that he’s worked with Mayor Jim Kenney and others to rejuvenate the Port of Philadelphia. Keller is backed by the influential Local 98 of the International Brotherhood of Electrical Workers. He beat back primary challenges in 2004 and 2010. The most embarrassing episode in Keller’s 25 years in the seat came in 2010 when the FBI searched his office and home as part of an investigation into some of his associates. His chief of staff and another aide eventually pleaded guilty to misusing state funds. Keller was not charged. It appears Fiedler and Keller won’t be the only ones running in the Democratic primary. Nicholas DiDonato, a retired Philadelphia police detective, is raising money for a run, saying Keller has been “invisible” in the district. “I believe an elected official should be accessible and visible. It shouldn’t be always that people have to come to you,” DiDonato said in a phone interview. If elected, he said he’d consider creating a mobile office that would be a presence in the district’s neighborhoods. DiDonato said the city shouldn’t enforce a parking ban on the median in South Broad Street, except in places where it would create a hazard. He also said he opposes the sweetened-beverage tax enacted by City Council, and he believes the city should bring the Mummers parade back to South Philadelphia. Also considering a run is attorney Tom Wyatt, who ran unsuccessfully for City Council in 2015.